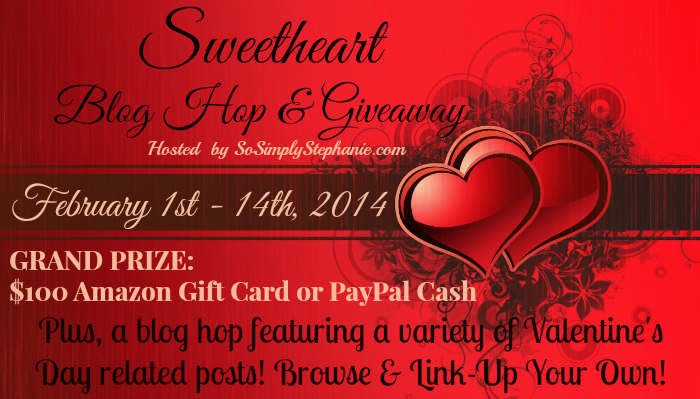 2014 Sweetheart Blog Hop & Giveaway! $100 Amazon Gift Card or PayPal Cash! posts in the linky below! Ready to Party? Great, let's get started! for a Chance to Win a $100 Amazon Gift Card or PayPal Cash! Disclaimer: VOID WHERE PROHIBITED. Must be of legal age to enter. Facebook, Twitter, Pinterest, Rafflecopter and other social media sites are not related to, or affiliated with this giveaway in any way. So Simply Stephanie is responsible for winner notifications and prize delivery. One winner will be selected via the Rafflecopter and will receive their choice of a $100 USD Amazon Gift eCard or $100 USD PayPal Cash. Winner will be selected on February 15th, 2014, and announced on SoSimplyStephanie.com. Winner will also be notified by email and will have 48 hours to respond. If winner does not respond another winner will be selected. Now it's Time to Link-Up Your Valentine's Day Blog Posts! Please be sure to visit others and comment to let them know you stopped by. Your submissions can include crafts, recipes, romance books, activities, Top 10 lists, and anything else Valentine's Day Related! Plus, browse other great posts, and vote for your top 3 favorites! Thanks for stopping by! If you haven't already, be sure to visit our Sponsors! They all donated to the giveaway to make this event possible! Time alone with my Better Half is always nice! Favorite thing about Valentines Day is to spend it with my loved ones.